I mean I literally put a couple of stitches in it (4 1/2 to be exact). I decided to go with one of my favorite linens 32 ct. Vintage Examplar. I think you're brave and incredibly bold to restart projects. I love that when something isn't exactly how you want it, you just go ahead and make it how you want it. I am so not that brave! Well all the colors look wonderful, can not wait to see your progress on these!! Oh how nice to be able to see your projects here, even though you are on the road! I love the colors of your threads here and seeing your new start. Have a safe and happy time and I look forward to hearing from you soon! both are going to look great Nicole!!! Your projects always do! I am going to have to go check out those silks! Thanks for the link to Gift of Stitching - Starr of Mind looks so pretty. I can't wait to see your finish! Gorgeous colors! Have fun on vacation. Your trip to New York sounds wonderful! Hope you take lots of pictures to share with us! 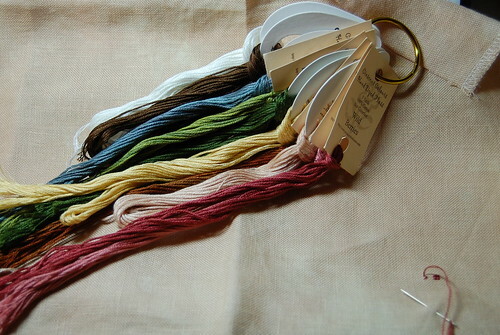 Have fun stitching MW with Bella Soie, they are really yummy silks! I love all that you do, starts or restarts!! May I ask where you get your floss tags that you use? Well you were in my neck of the woods yesterday! Your new start is lovely! I can't believe that you restart projects! I have a tendency to throw them against the wall if I don't like them. Those silks are gorgeous, so I think I can understand why you want to restart! Have fun in NY! I'm always restarting projects! Why do you start at the bottom??? Love both of your new starts, Nicole!! Happy stitching and SAFE TRAVELS! safe travels and happy stitching! Your blog is fantastic!! !.I'm reading this blog a lot of time ago, but I have never left a comment, because my english is not very good. I love looking at all of your stitching...restarted and new ones alike. both pieces look wonderful. 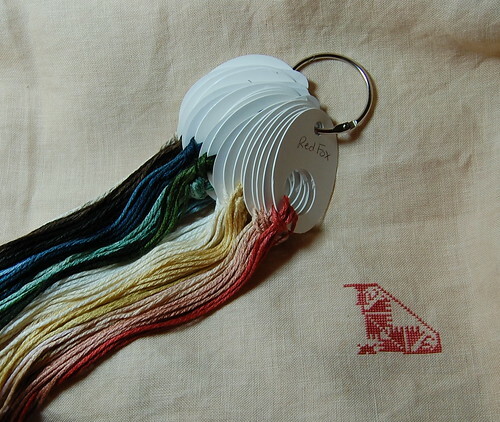 I know you have said before, but where do you get the floss tags like you have (the white ones) I love them!!! So perfect for projects! I ordered a set and got them in three days! !